The economic growth that has taken China to second place in the world by size of gross domestic product after the United States has been astounding — and its numbers are staggering in Africa too. In 2009, China surpassed the United States as the continent's largest trading partner. By 2012, its trade with Africa was double the United States'. The VICE and HBO documentary Chinafication of Africa looks at this phenomenon from the ground. The film follows, in two African nations that are home to a growing number of Chinese expats, some of the many Chinese men and women who left their home country to try and make it in Africa. And it explores the controversy over whether China's policy of non-interference in other countries' affairs helps prop up corrupt African governments. In the Democratic Republic of Congo, VICE visited a massive copper mine being revived as part of a $6.5 billion "infrastructure for minerals" agreement between Congo's government and two Chinese companies, made possible by loans from a Chinese state bank. VICE takes viewers inside a depot where Chinese traders buy minerals from artisanal miners, and to a Chinese-owned smelting factory that employees Kenyan workers to melt ore into steel. 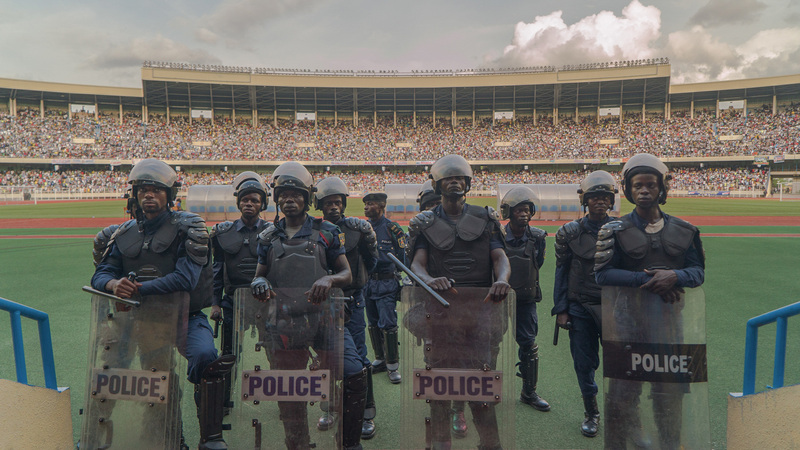 In Congo's capital, Kinshasa, host Isobel Yeung goes turf-side to watch a soccer game inside a large sports stadium built years ago by the Chinese. In Kenya, VICE walked along a Chinese railroad being built across the country with the mission of increasing trade across East Africa and moving more goods out of Kenya's port at Mombasa. The Standard Gauge Railway is Kenya's single largest project since colonial times. It will replace the century-old Lunatic Line, built by Indian and African laborers in the 1890s when Kenya was under British colonial rule. The Chinese are constructing and loaning money for the new railroad, but some say Kenya's leaders got duped: Kenya is spending at least $3.6 billion on the first leg alone. And to see what Chinese migration to Africa means for the next generation, VICE visited a neighborhood in Kenya's capital, Nairobi, where children are learning Mandarin in school — a first step toward a likely lifetime of engaging with the nation's new partners. Across the African continent, Chinese investment has become a major driver of growth. In 2014, China signed $70 billion in African infrastructure contracts, and an estimated 80 percent of the workers employed by Chinese firms on the continent are African. And while China may be only the world's fourth largest investor in Africa, it is now by far its biggest trading partner. Chinese state banks now loan more money to Africa than the World Bank. And increasingly, African leaders are looking East for opportunities to build infrastructure and boost economic growth and employment. "The strongest must help the weakest to rise. The Chinese will raise you up, and they'll let you get big," said Mack Dumba, Congo director of the Extractive Industries Transparency Initiative, a group advocating for better practices in the mining industry. "Americans should learn that lesson." Many Africans support Dumba's outlook on China. A 2014 BBC poll found that 85 percent of Nigerians and 65 percent of Kenyans had a favorable view of Chinese influence, compared with just 25 percent of Americans. On the whole, Africans viewed China more favorably than did any other population group in the world, with 70 percent approving of China, according to the 2015 Pew Global Attitudes Survey. And yet, Chinese investment has been criticized for undermining the social contract in weak states. By extending multibillion-dollar, unconditional loans, the argument goes, Chinese corporations are entrenching corrupt and anti-democratic African leaders who enjoy the political capital that comes from inaugurating new railways, roads and hospitals. Other critics contend that Chinese investments rarely benefit Africa's masses. And like many US and other Western companies before them, Chinese companies have been accused of environmental and social transgressions, such as deforesting Mozambique or profiting from child labor in Congo's cobalt trade. "You can see that in this country we have a lot of resources," said Emery Kalamba, a mining lawyer, opposition party senator and prominent critic of Congo's government dealings with China. "But where is the proof that we are really enjoying it? Five minutes from my office you will see people who don't have electricity." "The people here are more concerned about water, not big roads built by China," Kalamba said. "I don't blame the Chinese. I'm just concerned about the way this money is used." Western media tend to inflate the rhetoric surrounding China's rise in Africa. Headlines are often resentful and sometimes border on fear-mongering: China is "winning" Africa from the West. The United States must "catch up" to China if it hopes to maintain economic, security and cultural relevance in Africa. A monolithic "China" sees Africa as a place to get rich quick, and doesn't care much about the consequences. But behind these hyperbolic headlines there are people, actual Chinese moving to Africa — one million over the past 15 years according to the rough but generally accepted estimate. Some come to work for large Chinese companies that mine copper or cobalt. Others come to build those roads and railways. Many come to open small businesses: restaurants, pharmacies, furniture and electronics stores. "Big projects completed by big, government-owned companies dominate the headlines about the advancing Chinese agenda in Africa," wrote Howard French, a longtime New York Times correspondent in both China and Africa, in China's Second Continent. "But history teaches us that very often reality is more meaningfully shaped by the deeds of countless smaller actors, most of them for all intents and purposes anonymous." Africa today is a prime destination for an unprecedented migration of Chinese (as well as Indian, Turkish and other) investors, laypeople and entrepreneurs, all aiming to benefit from new opportunities across the continent. Take Robin Wei, an enterprising and adventure-seeking man from Shanghai, who left his wife and daughter behind in China to work at a factory on the outskirts of a small city in southeastern Congo that melts rocks to extract the copper buried inside. For years, Robin and his Chinese colleagues worked side by side with Congolese men, far from the image sometimes propagated of hostile Chinese overseers making Africans toil long hours under unsafe conditions for low pay. But outside of work, the two groups rarely mixed, showing that China's push into Africa has failed to create a cultural orbit in which the continent's nations would be attracted. The Chinese ate only Chinese food, while the Congolese employees place a pot atop the molten copper at the factory to cook maize flour – a traditional East African lunch. Chinese people have become a common sight in the industrial Congolese town of Lubumbashi, too. Chinese doctors prescribe both modern pharmaceuticals and ancient Chinese acupuncture to their patients, Chinese and African alike. Supermarkets sell Chinese foods and at night Chinese men can be seen playing cards at a Chinese-owned casino staffed by Congolese dealers. But despite their proliferation, many Chinese workers struggle to feel at home in a place that remains largely foreign to them. Wei is one of only a few Chinese people at his company who speak any Lingala, the local language. Many rarely venture outside the factory, preferring to spend their free time tending to Chinese vegetable gardens, playing ping-pong and watching Chinese satellite TV. Yet there are compelling economic reasons that so many Chinese people leave their homes to make new lives here in Africa. "In China, the rich families control the business, so it is difficult for the common people," Wei said. "If you want to live as an average man, no problem. But if you want to realize your dreams, you have to do it here." "Time and again, Chinese told me they did not fully realize how oppressive things were at home until after they had left," French wrote. "Living in Africa, they said, it felt as if a lid had been removed from a pressure cooker. Now, they could breathe." If Africa offers Chinese people an environment in which to grow both personally and financially, what remains to be seen is whether Africans themselves will share in that growth. Unfortunately for Congo, the outlook for that is grim. The country's leaders are in the midst of a controversial $6.5 billion deal with two large Chinese companies to mine billions of dollars' worth of copper over the coming decades. The will be used to pay back loans with which Chinese companies build hospitals, roads and other infrastructure. Production began in November, but the deal is secretive, and it remains unclear whether the remaining profits will be funneled away to Chinese investors and Congolese officials, leaving little for the Congolese people. Contrary to the view of China as imperialist and corrupt, the future of China in Africa may depend foremost on the actions of Africa's leaders. As for the Chinese, perhaps it's time to humanize them and see them as entrepreneurs who venture abroad seeking a better life, but whose presence may be causing some unintended consequences in the weak, authoritarian African states to which they come. VICE HBO's new documentary Chinafication of Africa airs Friday, April 22, at 11pm Eastern Time.